Randomness is an invaluable resource in many areas of science and technology ranging from Monte Carlo simulations to secure encryption methods. While computer generated random numbers can be used for some applications, they remain fundamentally non-random in the sense that anything generated by an algorithm is at least in principle predictable. However, quantum physics provides randomness which is unpredictable based on the fundamental laws of nature. An accessible and convenient source of quantum randomness is ubiquitously available in the form of single photons. Several photon based random number generators utilizing quantum indeterminism have been proposed and realized in the recent past. However, with respect to commercial availability, not many implementations so far were reliable and/or cost efficient enough for routine use outside the physics laboratory. 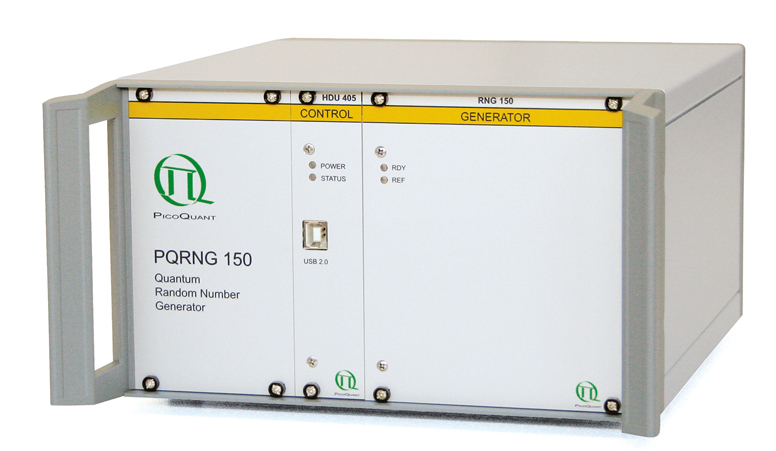 The PQRNG 150 is a new Quantum Random Number Generator (QRNG) based on the quantum randomness of photon arrival times. It provides turn-key usability, provable and long term statistical quality, and high speed. The design creates a new quality in the sense that it offers substantially higher bit rates than previous solutions available to the public. This has become possible by exploiting most recent photon timing instrumentation and state-of-the-art data processing in hardware. The post-processing algorithm applied to the raw data is based on solid predictions from information theory which guarantee conservation of randomness. This allows for the use of the delivered random numbers in unconditionally secure encryption schemes. The random numbers delivered by the PQRNG 150 have successfully passed the most stringent testing possible today. Results are published in Applied Physics Letters, Vol.098, 171105 (2011) and in Applied Physics Letters, Vol.101, 159901 (2012), which includes results of the re-testing of the generator after 20 months of operation. For demonstration purposes chunks of random data generated by the PQRNG 150 can be downloaded directly from a dedicated webserver, which also provides continuous streams of random data by means of DLLs for access to the server.